African violets have dark green, fuzzy leaves and produce small flowers. The leaves of these plants are delicate and prone to injury from overhead watering or rough handling. 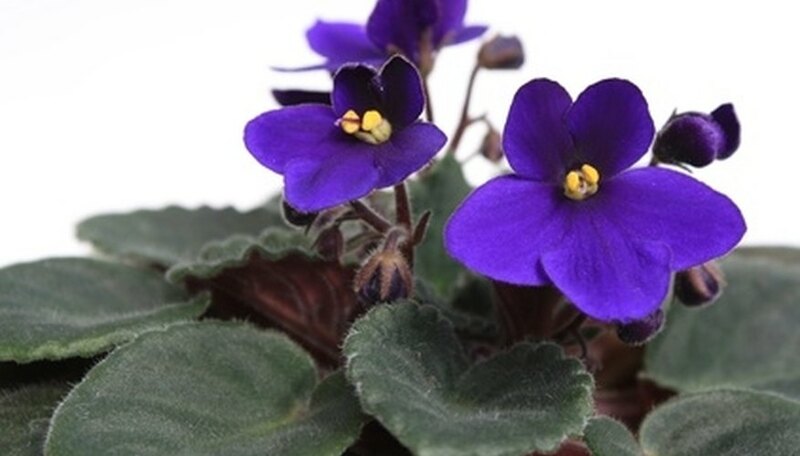 However, African violets do well indoors if cared for properly, enjoying the mild temperatures and indirect sunlight found in the average home. Place your African violets in a well-lit area of your home, but away from sunny windows. Direct sunlight may burn or dry out the delicate leaves. To encourage your African violets to bloom, allow the plants at least eight to 12 hours of light, and eight hours of darkness each 24-hour period, as suggested by the University of Florida IFAS Extension. Keep a saucer or plate covered with pebbles and water beneath your African violets. This increases the humidity around the plants. The University of Florida IFAS Extension advises, however, you should not place the plant pots directly in water, because this can damage the roots. The water level should not be above the top of the pebbles on the plate or saucer. Fertilize these plants each time you water. According to Smithsonian Gardens, you should dilute the fertilizer in water at 1/4 to 1/2 strength, and you should use a balanced fertilizer, such as 20-20-20 (this is displayed on the fertilizer label). In other words, if the fertilizer calls for using 1 capful per quart of water, use 1/4 to 1/2 capful, mixing it thoroughly in your watering can before applying to the plant's soil. Always use lukewarm water, rather than cold, when watering African violets. Water African violets only when the top 1/2 to 1 inch of the soil is dry. Overwatering these plants easily causes fungal diseases such as root rot. Check for plant pests each time you water or prune the plants. Look near the stems and beneath the leaves for visible bugs, webbing, or a sticky residue that could indicate a problem. Remove insects manually, using a damp cloth, when possible. Any substance sprayed directly on the leaves may cause spots. You may have to use sprays anyway if infestations are bad. Remove dead blossoms and leaves simply by carefully pinching them off. How Tall Does a Caladium Get?